You loved the film. 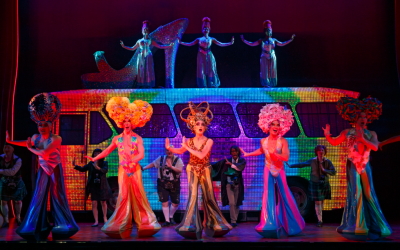 Now you can love the touring Broadway in Austin production at Texas Performing Arts of the first national tour of Priscilla Queen of the Desert The Musical. The musical magic happens next week: May 8 -12, 2013 (Wednesday–Friday at 8 p.m., Saturday at 2 p.m. & 8 p.m.; Sunday at 1 p.m. & 7 p.m. Bass Concert Hall at 2350 Robert Dedman Drive on the UT campus will be the site of the musical shenanigans. Broadway in Austin and the crew at Texas Performing Arts always do a first rate job with each production. 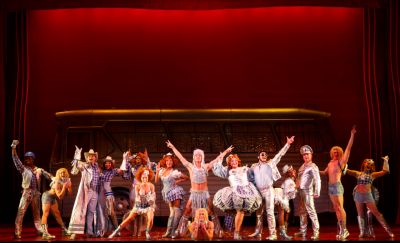 You likely know that Priscilla Queen of the Desert The Musical won a 2011 Tony Award® for Best Costume Design for Academy Award® winners Tim Chappel and Lizzy Gardiner’s designs. The new hit musical received three Best Musical award nominations from the Drama Desk, Drama League and Outer Critics Circle Award organizations. Tim Chappel and Lizzy Gardiner were also honored with 2011 Outer Critics Circle and Drama Desk Awards for Outstanding Costume Design. Tickets start at $30. Tickets on sale and are available at the Bass Concert Hall box office, all Texas Box Office Outlets, by phone at (512) 477-6060 or online athttp://www.broadwayinaustin.com. For groups of 10 or more, call toll free at (877) 275-3804 or e-mailAustin.groups@broadwayacrossamerica.com. Recommended for ages 13+ due to explicit language and mature situations.